Home Author Interview Interview with author of Three For Me, Sofia Clarke! Sofia Clarke is a Gemini and Cancer writing duo obsessed with reverse harem, menage, and paranormal romance. We LOVE sweet, affectionate, and protective men who adore their lucky ladies and sometimes their lucky men too. As of 2/12/19, we have written seven contemporary romance short reads and one full-length reverse harem novel. We have a ton of steamy romance coming, including a paranormal reverse harem novel. Rest assured, we’re just getting started! The Gemini was born in the Houston area and the Cancer in LA. We currently reside in Colorado. 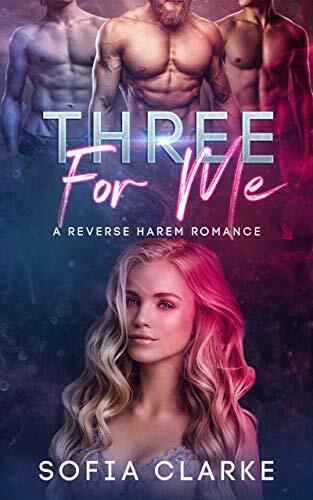 Three For Me – A Reverse Harem Romance was inspired by a dream (no joke) the Cancer had, as well as our love for steamy menage and reverse harem! It got started when the Gemini got inspired by her idea and wrote 7000 (not entirely good) words in a single night. We create characters using information sheets with physical descriptions and basic motivations. From there, we flesh out our characters by focusing on their core motivations. Although we use a story outline, we let it evolve organically and surprise us. Creating stories is such a beautiful form of art. Just the fact that a person can sit down and create something thousands or even millions of people can enjoy is absolutely amazing. Both of us have been writing for roughly 10 years, but it’s taken us all that time to make it our profession. We write pretty much everywhere. Coffee shops, the kitchen, bedroom, the park. We both like to exercise to get the juices flowing. We take our ideas from culture, cool dreams, and random brainstorming. The Gemini likes thought-provoking action-adventure stories. The more romance included in them, the better. The Cancer loves stories that are sweet, affectionate, and dramatic. Insta-love is her weakness. Train yourself to be consistent. Watch successful authors and do what they do. In this sweet, steamy romance novel, her heroes are totally obsessed and eager to please. Sometimes wishes really do come true. This is a standalone story with an HEA or HFN guaranteed! I glanced at my phone as I stepped out of work. It was only a few minutes to midnight on a cold winter’s night, and as I looked out over the frostbitten city, I wished it was spring already. Winter was almost over, but it was holding on with a vengeance. The sky was partially overcast, and the moon and stars were hidden in patches but not completely shrouded out. And just ahead of me was my least favorite alley. It was narrow, damp, and dark and always gave me the creeps. I never liked this time of night. I worked at a hospital in a moderately rough neighborhood where the city’s upper and lower classes met in a strange tangle of crime and frantic police work. I was bundled up tightly, watching fog roll off my breath. A loose scrap of paper tumbled down the street as wind blew. Everything was quiet. I rubbed my hands together, wishing I would have remembered to bring gloves. I’d forgotten them after being called into work early that morning to help during a crisis. Since I didn’t own a car, I’d literally run from my apartment to the hospital where I’d seen one of my coworkers being dismissed due to an injury. She’d slipped on a wet floor and had fractured her elbow during a patient emergency. Now I was regretting my lack of preparation. I supposed this was life—more specifically, the life of a nurse what with its unexpected call-ins, hectic bursts of activity, and long hours. The pay was good and the hours weren’t terrible considering I worked four days on and then had nice three day weekends. Plus, the reward of helping people left me with a sense of satisfaction at the end of the day. But these benefits didn’t stop me from feeling like I was rushing through things, or rather, using my hectic schedule to ignore things that had been building in me. Something was lacking. In these lonely times walking home, I would have liked to have had company. The dreamy part of me was able to picture what kind of company this would be. I saw a handsome and muscular man. He would speak to me like a gentleman, whispering sweet words of affection while looking into my eyes with love. I’d never had a man treat me this way, and the good girl in me would have been happy with it. That was one part of me. There was another, one that I would call the bad girl that had another idea—to be treated this way by more than one man at the same time. Due to my upbringing, I was convinced that wanting more than one guy at the same time was wrong. But was it wrong? I was distracted from dwelling on this question when a cat scurried out of the alley. It looked at me with glowing green eyes, some 30 yards away, and I sensed fear. It sped off abruptly, which prompted me to examine the way ahead and try and see what presence might be lurking in the alley’s shadows. I felt a wave of uncertainty wash over me. I stopped moving and wavered. Something didn’t feel right. Was it Todd? We’d broken up four months ago, and he’d harassed me with text messages and calls for weeks afterward and had even shown up at my work asking for me—which was ridiculous because he’d been the one who’d left for someone else, not me. Eventually, he’d stopped cold, and I’d been glad. He’d been abusive during our relationship and had hit me several times. Even so, we’d dated for two years before finally breaking up. You’re scaring yourself. He’s not here, I insisted, and I forced myself to press on, fighting the impulse to remain planted. I wished suddenly now more than ever that I had a man to walk me home, to protect me and make me feel safe—or three of them. I wished I could have them, but yet I scoffed at the idea. It was absurd. Why was I always going back to this silly fantasy? Where had I even gotten it? I knew I would be better off not thinking about such things. Living a normal life made much more sense because, after all, I was from a normal family. My parents weren’t especially religious, but we went to church every now and again and were fairly traditional. My dad and mom had been married 30 years, had gotten college degrees, bought a modest house. They’d made ends meet by running a small family business and had raised two kids—my younger brother, Daniel and me. They’d lived the life that everyone said you should. The good girl in me wished that I could have that life too. Find a nice guy, settle down, and have kids. I’d thought about this stuff for a long time, but after my awful breakup with Todd, I’d gotten too scared to try anything, regardless of whether it was with one guy or more. Ever since love had failed me, I’d been in limbo. Todd had stolen my faith—I think because most of all he’d seemed like Mr. Perfect at the beginning and had made all the right promises and I’d truly believed that he was my one and only. Except he’d started beating me and forced me to hide the bruises and had brought me down with his words more times than I could count. Then to cap it all off, he’d cheated on me with his ex, and had left me for her. He’d come crashing into my life and then vanished, leaving me feeling uncertain and unsafe. I was stubborn and refused to be broken, which was why I still walked home from work. I was a big girl and could take care of myself. And I told myself that the way home wasn’t that bad, and in all fairness, it wasn’t. I worked only a couple of minutes from my apartment complex, and the strange upside to these walks was the reminder they gave me. Life was much bigger than my problems. As a nurse, I’d seen some gnarly stuff. Being outside at night in the middle of the city gave me a larger perspective, and strangely, helped clear my head. After my shift, I definitely needed to do so. I’d had a patient pass away a few hours ago. Her name had been Evangeline Williams, and she’d been the reason, besides my coworker’s injury, for my emergency call-in. Evangeline had fought for hours before finally passing. I hadn’t been in the room when it had happened, but she’d been waited on by a host of loving friends and family. The doctor had delivered the news, and her husband had demanded to see her. I’d been standing several feet away watching as frantic tears had streamed down his face. I’d recognized the love he had for her and had felt emotion swell inside my chest. I’d gotten to know him over the course of her long stay and if there was one thing he believed it was that Evangeline was his angel. Since I’d spent a lot of time with her, I’d come to appreciate his sentiment. She’d been one of the sweetest people I’d ever met. Her fight had been a tough one, but she’d never complained. On the contrary, she’d liked to compliment the staff. She’d often reminded us ladies that we were beautiful and the men that they were handsome. It had become a running joke that if anyone wanted a confidence boost that they should go see Mrs. Williams. “I’m honestly not sure. I feel confused,” I’d replied, and I’d absently wondered in the back of my mind how our conversation had moved in this direction. I’d been on the verge of asking her more about her wish when I’d received a call from my supervisor. I’d told Evangeline goodnight and left, my head turning over with the notion of making a wish. It had seemed like such a silly idea to me, but it had stuck with me throughout my busy shift. Presently, it was still with me. I knew I needed a wish. Here I was at 24, still single and with almost no friends. Other than my parents, my brother, and my best pal Melon, my adorable puppy, I was alone. I would have been happy with a man to add some zest to my life. Heck, two would have been more than enough. But three? Holy smokes. Could wishes make something as incredible as that come true? The pragmatic side of me said there was no way in hell. The dreamer in me said that I had nothing to lose, and so I looked up. I felt my ears burn with the admission and an embarrassed smile broke across my face. I blew my wish to the star, then I glanced around instinctively, hoping that no one was watching my ritual. My eyes went to the creepy alley again, and I felt a shiver. I hurried forward, hoping to pass it as quickly as possible. I kept myself from looking at its dark opening as it appeared on my right. My apartment complex was only two blocks away. All I had to do was get there. I was just about to make it past the alley when a shadow emerged. My head jerked in its direction, and I felt an instant spike of adrenaline. A figure stepped out from behind an air conditioning unit, looking in my direction. At first, I couldn’t quite make out whether it was a man or a woman, then its sheer size gave me the answer. It was definitely a man. Was it Todd? That terrible question flashed through my mind, and I paused just long enough to feel the hair stand up on the back of my neck. Then the man rushed toward me. I was frozen in shock as details of him sprung out in the dim light. He wore a black hoodie that was pulled low. His gloves were black, as were his boots, which stabbed into the ground as he hurtled toward me like a wild animal. He closed the distance, and I saw his eyes. They were bright and menacing, but they weren’t Todd’s. In a way, that was worse. At least with Todd, I knew what to expect. I let out an involuntary scream and finally ran. I only made it a few feet before he caught up to me and clutched my arm, digging his fingers into it. I wheeled around and smacked him in the face with my purse, and he stumbled back, but he managed to hold on, pressing his fingers into me all the more. Pain lanced through my arm as I tried tearing myself away from him. He grabbed me with his other hand, doubling his grip, and pulled with his entire body. I lost balance and fell toward him. Our bodies collided and in the next moment I was dragged into the alley and slammed bodily against a brick wall. He lifted his fist to strike me again, and I had the certainty that my life was about to end. In that instant, a miracle occurred. Voices filled the air, and three men appeared. It took them only a split-second to come charging at us. Fear flashed across the face of my attacker, and he let go of me and bolted in the opposite direction. My rescuers hurried after him, disappearing into the shadows. They passed by me so swiftly that I barely had a chance to see who they were. In my panicked state, I thought that they might be coworkers who had been passing by the alley and had seen us. I waited for them to return, trembling. I hugged myself as their voices echoed down the alley. Everything went quiet, then a handful of seconds later, they reappeared running toward me, which was when I registered that they weren’t coworkers at all. They were, however, the most stunningly handsome men I’d ever seen. Each of them was fit and seemed to be in their late twenties. Their faces were filled with protective instinct. The one on the left had curly brown hair, olive skin, and blue-gray eyes. He had a prominent and straight nose that complimented his angular face. The one in the middle was tall and broad-shouldered. Even with his clothes on, I could see every muscle in his huge body bulging. His square face, which was filled out with a thick beard, was red. His reddish-brown hair was tousled from running. The one on the right had copper-colored skin, a fine face, and shoulder-length black hair. But it was his dark, almond-shaped eyes, so focused and watchful, that stood out the most. I burst into tears, unable to help myself. Seeing my reaction, he and the others came forward and wrapped their arms around me. I reciprocated and melted into their embrace, not caring that I was hugging complete strangers. Several seconds passed before I was composed enough to let go. “I’m…I’m fine. Thank you,” I muttered. “Do you have a name? Is there someone we can call?” he asked.